We are unwinding from a great week of sea kayaking in Northern California. 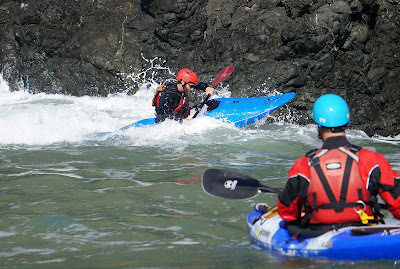 Our sea kayak week began with a journey to San Fransisco for the 5th Annual Golden Gate Sea Kayak Symposium. We were honored to be coaching among some of the best sea kayak coaches in the world and stoked to meet a bunch of enthusiastic students. Jeff of course spent the weekend playing in the rocks outside the Golden Gate Bridge teaching Intermediate and Advanced Rock Gardening Courses including a rock gardening class in whitewater kayaks. I was in the Horseshoe Cove area teaching Rock Gardening 101 and intermediate and advanced strokes classes. Rock Garden 101 of course is one of my favorite classes to teach. It is so fun to see students gain knowledge and confidence to paddle near and among rocks in moving water. There were lots of memorable moments for coaches and students alike. Our rock garden 101 class was thrilled by a gray whale cruising into the bay and passing close to where we were working. Everyone of course was delighted by the warm sunny days and clear views of Alcatraz, the Golden Gate Bridge, and San Fransisco. In the evening, we enjoyed Justine Curgenven's adventures in paddling Tierra de Fuego, Out of Sight, Out of Mind's Trashpedition and the Ikkatsu Project. Cheers to Matt Palmariello and Sean Morley for putting together an outstanding event!!! And all the sponsors who made it possible. After 3 days of teaching, the coaches were ready to get out and play. Some stayed for BCU 5* Training and trips around the bay area. We rallied some coaches and headed for home for some Mendocino Rock Gardening. Here's a link to photos of our Post GGSKS Mendo Rock Gardening. Thanks you for sharing those wonderful pictures!